This solidly constructed 19-inch wide teller truck contains 4 drawers and is mounted on four 4" casters, two fixed and two swivel, a convenient foot brake to enable it to stay in position of desired, and two handles on the front for easy movement from place to place. It is available in 16 different baked powder-coated finishes. Units are of Integrated, uni-body, 18 gauge, double side wall construction. These trucks are the most efficient and secure method of transferring cash between teller stations and vault. Units come standard with key locks but can also be furnished with combination locks, electronic locks, or any combination of the three. You can be confident in the quality of the construction of these units and they will give you years of service. The cabinets shown are in Champagne finish. Overall dimensions: 19" W x 19" D x 31-7/8" H. Shipping charges on this unit must be calculated separately. 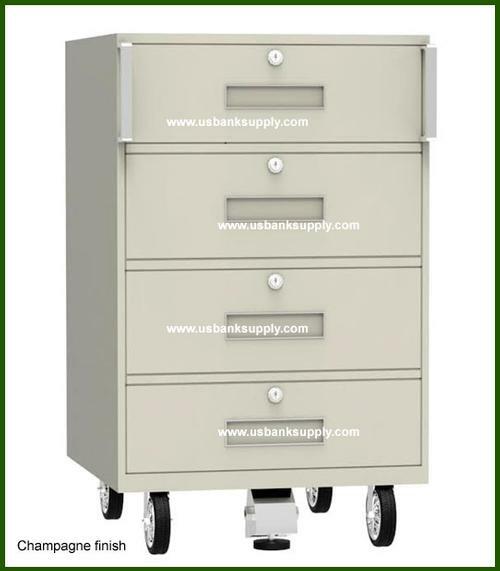 This solidly constructed 19-inch wide teller truck contains 4 drawers and is mounted on four 5" casters, two fixed and two swivel, a convenient foot brake to enable it to stay in position of desired, and two handles on the front for easy movement from place to place. It is available in 16 different baked powder-coated finishes.